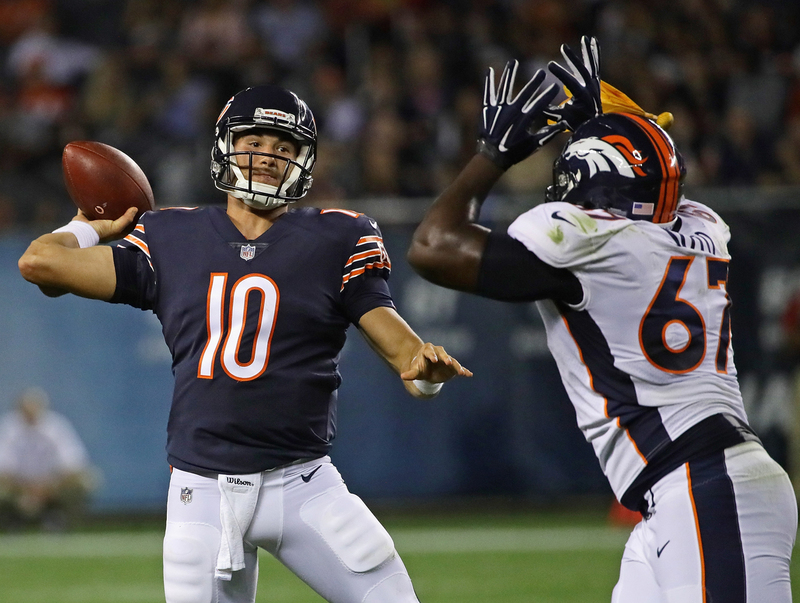 Mitch Trubisky played well in his Bears debut, but the rookie quarterback still has a lot to learn and show before earning the starting quarterback job. So time to pump the brakes? Yes. For one, Trubisky entered the game just after the two-minute warning in the second quarter, so he was playing with backups and against backups. All 25 of Trubisky’s throws came either from the shotgun or off play-action, meaning he never had to set up off a traditional dropback. And it’s understandable why coordinator Dowell Loggains and Co. did it this way, of course. The idea was to get Trubisky’s feet wet, and get him some confidence and comfort. The Bears got more than that, so now they can test the rookie in different ways in Arizona on Saturday. As for the Bears? Guess what? If they got it right on Trubisky, no one will remember the cash they threw at Glennon. So the rookie’s play is turning up the heat? I think they’d tell you: Good. “I haven’t been anywhere where we’ve done this,” coach John Fox said, as we talked about the quarterback investment. “But you have to throw currency at it. People argue it’s the most important position in sports, let alone football. And they all have ability.” Fox is including Mark Sanchez in his assessment too, which underscores the reality. The Bears only really have to be right on one of them. 2. Eli joins the crowd. Earlier this week, Eli Manning became just the latest quarterback to come out and say that he wants to play into his 40s, telling ESPN’s Ian O’Connor that “sitting here right now, I think I can play another four years.” Tom Brady’s been talking that way for almost a decade—and is now backing it up with his play—and guys like Aaron Rodgers and Andy Dalton have chimed in with similar goals more recently. So is it realistic for that sort of career to become more the norm? I think it’s no coincidence that Manning would talk that assuredly, knowing that he’s been working with Tom House and Adam Dedeaux, the renowned QB gurus who have worked with about half of the NFL’s 32 starting quarterbacks. We mentioned those guys last week in discussing Matthew Stafford, and it’s worth mentioning them again here because of House’s belief that quarterbacks should be able to play until their 45. Of course, football isn’t baseball, and serious injury can foul up even the best laid plans. But with the protections given to quarterbacks, and players harboring these kinds of aspirations, it’ll be fun to see if someone can actually get there as a starting quarterback. 3. Bill-ding for the future. In the immediate aftermath of GM Doug Whaley’s termination in April, one source that was inside the Bills’ war room described their just-concluded draft week to me in a pretty succinct way: “The weirdest three days.” There was a lot going on, to be sure, but there’s one anecdote I got then that sticks out now in the wake of the team’s decisions to move Sammy Watkins to the Rams and Ronald Darby to the Eagles. It was that Sean McDermott had carte blanche to pull players off the board for character reasons. The bottom line is that McDermott arrived in Buffalo with a vision for what he wanted in a program, and who would and wouldn’t fit that. And just as clear was that Darby and Watkins had baggage. In Darby’s case, much of it was self-inflicted. Character flags dropped him to the second round of the 2015 draft and, after a stellar rookie year, he underachieved badly last year, eventually getting benched for a half in November. Watkins’ problems were not really of his own doing. His foot issue was so bad in September that teammates noticed he was barely making it through walkthroughs, and yet no one stopped him before the injury worsened and the team had to shut him down for two months. Add that to the draft capital the team yielded to draft Watkins in 2014, and the fact that he’s in a contract year, and it’s pretty clear that the club/player relationship had become incredibly complicated. And when all this is considered, it was unlikely either player would be in Buffalo past the terms of their rookie deals, while trading the two of them gave McDermott a better shot at avoiding bumps in building over the next few months. So the fact that new GM Brandon Beane was able to replace Watkins and Darby on the roster (albeit with less-talented guys, in wide receiver Jordan Matthews and corner EJ Gaines) and pick up second-round and third-round picks for next spring in the process is a big win for the franchise. As for the idea the Bills are tanking? It seems foolish to me. Darby wasn’t very good last year, and Watkins had 28 catches. So you tell me how much they’re actually losing from what they were a week ago. 4. Niners’ early returns show sound approach. Time will tell if John Lynch is the right general manager for the 49ers, but one thing is pretty clear: Jed York’s unconventional hire has put together a draft class that is already showing signs it could provide a nice foundation for the future. There’s a real good chance that Solomon Thomas and Reuben Foster are starting on opening day, and Foster looks like he could be a legitimate candidate for defensive rookie of the year. On offense, the only thing keeping explosive tailback Joe Williams (who, as Peter King detailed in April, coach Kyle Shanahan loved) from grabbing a significant role is that incumbent Carlos Hyde has had a dynamite summer; and quarterback CJ Beathard has wedged his way into a battle with Matt Barkley to back up Brian Hoyer. OK, so that’s nice for now. But what I think is significant is how Lynch, top lieutenant Adam Peters and the personnel staff have put together a team for their coaches, rather than just picking players and letting the coaches figure it out. Lynch told me back in February that Shanahan gave a detailed, and lengthy, presentation to the scouts on what he wanted in each position. Lynch told me then, “We have a very similar vision for what we want.” And that vision seems to be coming to life now. The Niners have a long way to go, but I’m guessing you’ll see some positive signs of where they’re headed before the season’s out.